As E. H. Gombrich once observed, the still life is compelled to challenge and at the same time perpetuate tradition. Without the elements of recognition and comparison, and the discovery of the familiar in the unfamiliar, the genre would lose most of its meaning. This lavishly illustrated volume documents the extraordinary challenges that artists in California have brought to the tradition of the still life as they have transformed and revitalized the genre over the course of the last century. 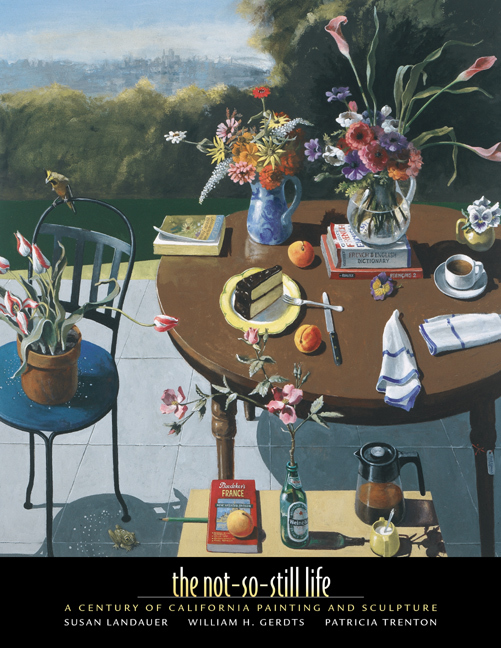 In abundantly illustrated essays, as entertaining as they are informative, The Not-So-Still Life traces the great variety of media and forms these artists have engaged as they have moved the still life not just off the table, but off the wall and into three dimensions. Susan Landauer, William H. Gerdts, and Patricia Trenton investigate a range of forces and influences—whether historical, sociological, economic, psychological, or biographical—that have played into this evolution, from the plein-air Impressionism of the early twentieth century to the Synchromist bouquets of Stanton Macdonald-Wright, the revolving table settings of Charles Ray, and the electronic sculptures of Alan Rath. In doing so they deepen our understanding of American art over the last century. Presenting, interpreting, and celebrating the world-renowned and the lesser-known California artists who have uniquely defined and redefined the still life, this volume offers an exploration of the sensual pleasures, the aesthetic challenges, and the intellectual and perceptual associations of a century of art through the prism of a single genre. Susan Landauer is Chief Curator at the San Jose Museum of Art and author of Elmer Bischoff: The Ethics of Paint (California, 2001), San Francisco School of Abstract Expressionism (California, 1996), and California Impressionists (California, 1996). William H. Gerdts is Professor Emeritus of the Graduate School at the City University of New York. He has published extensively on American Impressionism. Patricia Trenton is the author of Independent Spirits: Women Painters of the American West, 1890-1945 (California, 1995).